That’s it I’ve fully fallen in love with sweet potatoes and honestly have no interest in any other type of boring potato. I can turn a sweet potato into so many different recipes. So sorry for any followers who may not love sweet potatoes as much as I clearly do, because I’m adding yet another sweet potato recipe tonight. Sorry totally not sorry. I was on Facebook this morning and saw a friend post an ice cream post with store bought ice cream cones. So last night I prepared the ice cream and I needed to enjoy it with a cone. So dates to the rescue on this recipe ( as well as shredded coconut and gluten free oats). After patiently waiting all day for the cones to dehydrate I finally got to enjoy this wonderful creation of mine. I truly hope other people love this recipe as much as I do. Add the 1 1/2 cup cashew cream and all the ingredients to a high speed blender. If too thick add extra water. Once combined I stored mine in plastic freezer safe Tupper ware over night. Now drum roll please for these fabulous and super easy raw ice cream cones! Add the oats and shredded coconut to the food processor and grind well. Then add in the dates and allow to combine to a sticky dough. Now apparently there are cone molds to make this a lot easier, but I just formed it into a cone and checked on it every hour to adjust so it stayed open on top. After its formed into a cone then place the cones on a dehydrator sheet that has a non stick mat or parchment paper. Dehydrate at 145° for one hour then turn down to 115° and Dehydrate for 10 to 12 more hours. If you don’t care about this dessert being fully raw then you can keep it at 145° and it will be done sooner. If you dehydrate at a higher temp when done set in freezer to cool for 5 minutes. Should make 2 cones. Introducing an even more incredible version of this lovely creation of mine. Yes I’m pretty grateful I get to eat all this incredible food. 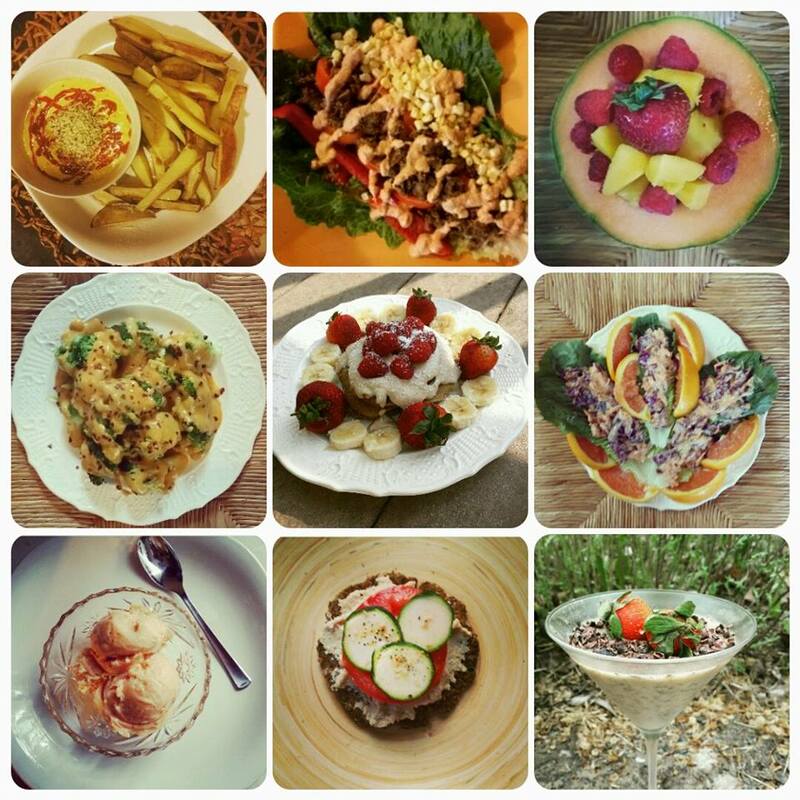 Truly hope others are enjoying these recipes. Feel free to leave a comment on the page if you’ve tried something. Seeing I’m always trying to make new creations and try to not eat the same thing repeatedly I though how can I possibly make this even better that yesterday’s creation. Well viola this is how. 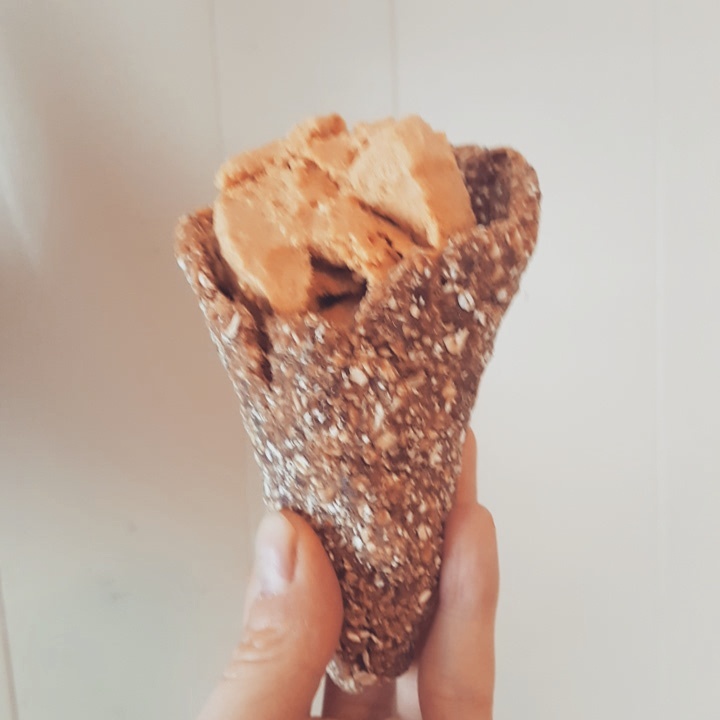 Adding carob chocolate to the cone took this to a whole new level of absolute goidness! I wanted to change up the ice cream as well so I added to yesterday’s sweet potato ice cream in some carob powder, fresh almond butter that I had made with mixing almonds, cinnamon, and a bit of coconut oil, but any nut butter creation will do. I really do impress myself some times and yes it’s probably better than what it looks like. Absolutely loving this. My 11 year old niece is sleeping over this weekend so these are on the menu for sure. Now let me get the fabulous recipe! 1/2 cup of the already made sweet potato ice cream, see above recipe for that. Melt chocolate I added a drop of coconut oil to a pot and heated the chips to melt. Then dip the the cone or use a knife and spread on chocolate. 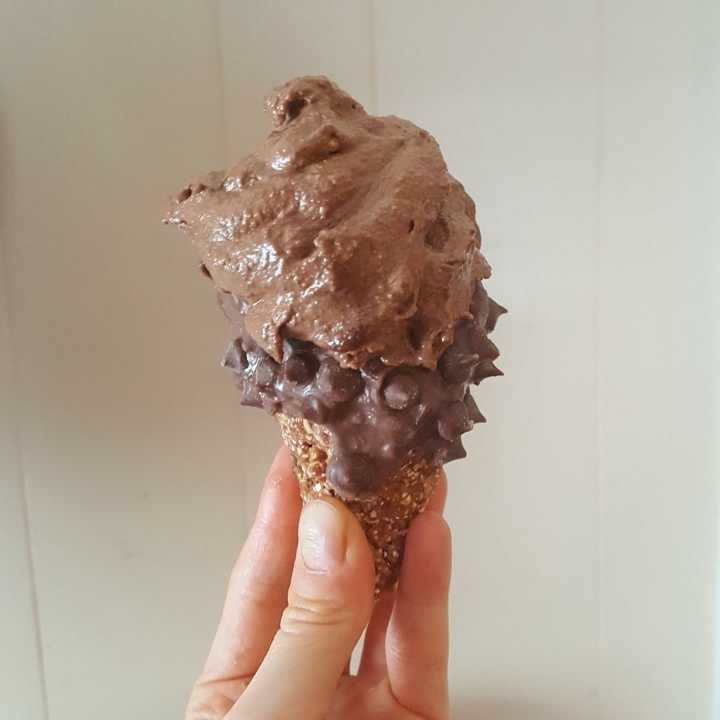 Then I sprinkled on some carob chips and froze the cone while I made the ice cream. I froze it for about 5 or 10 minutes just so the chocolate would harden. For the ice cream add all the ingredients to a food processor and mix well. Now prepare the dessert and go enjoy it!